In a courtyard, in central Earls Court, sculptural artist Diana Edmunds has installed a shocking red steel and fabric sculpture. Manufactured and installed by Architen Landrell, the installation was designed to juxtapose with the grey and formal environment of central London. Edmunds’ work, realised in collaboration with tensile structure specialists Architen Landrell, Wilkinson Eyre and Anthony Hunt Associates, consists of two overlapping 16m-long leaf forms pierced by a series of inclined columns. The architecture is designed to achieve maximum contrast with the aluminium louvered façade of the thirty storey tower that forms its backdrop. 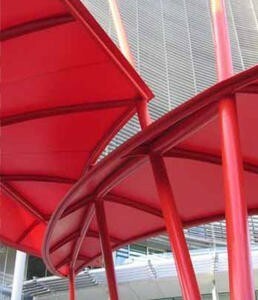 A red tensile PVC fabric skin is stretched over curved steel ribs that branch out from rigid tubular spines. The complex form derives from Edmunds’ intention that the leaf elements and columns would appear to have been delicately assembled and positioned ‘as if caught in the process of falling’. The dimensions of the structure were tailored to enable the offsite assembly of the wings at their maximum transportable size. The resulting sculpture provides the key focal point of the new piazza in front of the tower, and also functions as an external canopy.